Although he is supposed to be on leave, Gamache cannot walk away from a crime that threatens to ignite long-smoldering tensions between the English and the French. Meanwhile, he is receiving disquieting letters from the village of Three Pines, where beloved Bistro owner Olivier was recently convicted of murder. "It doesn't make sense," Oliviers partner writes every day. "He didn't do it, you know." As past and present collide in this astonishing novel, Gamache must relive the terrible event of his own past before he can bury his dead. Sir? came the young voice over Gamaches headphones. He hoped the young agent couldnt hear the strain in his voice, the flattening as the Chief Inspector fought to keep his voice authoritative, certain. Louise Penny's Gamache will remind readers of Donna Leon's Commissario Guido Brunetti. Like Leon's novels, Penny's depend on well-crafted characters and intricate plots rather than on violence and tough macho detectives (Carol G). Fans of a good mystery that keeps the reader engaged without resorting to gratuitous bloodshed will appreciate Bury Your Dead. The story is rich in characterization and setting, bringing to life tension between French and English interests in Quebec, the pain of an investigator dealing with loss of comrades, and the stark beauty of winter (Marta T). Murder mystery aficionados looking for more than a cozy or romantic mystery, who want to look into the depth of the human heart and its capacity to both wound and heal, would be well advised to look at Louise Penny's series (Nona F). (Reviewed by BookBrowse First Impression Reviewers). Starred Review. Gamache's excruciating grief over a wrong decision, Beauvoir's softening toward the unconventional, a plot twist so unexpected it's chilling, and a description of Quebec intriguing enough to make you book your next vacation there, all add up to a superior read. Starred Review. Reminiscent of the works of Donna Leon, P.D. James, and Elizabeth George, this is brilliantly provocative and will appeal to fans of literary fiction, as well as to mystery lovers. Starred Review. Increasingly ambitious in her plotting, she continues to create characters readers would want to meet in real life. Starred Review. Penny hits every note perfectly in what is one of the most elaborately constructed mysteries in years. 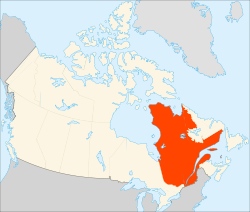 The province of Quebec is Canada's second most populous province, after Ontario. It is the only Candian province to have French as its sole official language, and has a predominantly French speaking population with 4 out of 5 ranking French as their first language, and 95% able to speak it. Eight percent state that English is their first language, and about 40% claim to be bilingual in French and English. Most of the province's 7.5 million population live in urban areas near the St. Lawrence River between Montreal and the capital, Quebec. So, one might ask, how did the people of Quebec end up speaking French, when the rest of Canada has English as its official language?